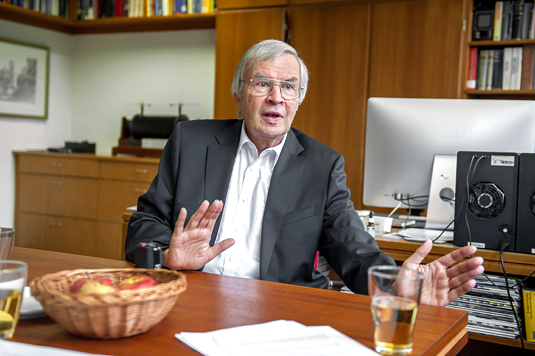 LMU’s Nobel Laureate Theodor Hänsch talks about creativity in physics, Steve Jobs’ soldering skills, and the secrets of precision metrology. Professor Hänsch, the results of your latest work have led you to question the value of a basic parameter in physics. Can you tell us a little more? Hänsch: A few years ago, we showed that the radius of the proton, one of the building blocks found in all atomic nuclei, is 4% smaller than the accepted value, although that value was thought to have been well established long ago. We now have indications that the deuteron, the nucleus of the stable heavy isotope of hydrogen, is also smaller than the size given in the textbooks. Hänsch: I wish we knew the answer, but at present I can only speculate. There is no obvious reason why the nucleus of a hydrogen atom with one electron should differ in size as that of an atom with a single muon. Both must obey the laws of quantum electrodynamics. If there were a difference between them, it would cast doubt on whole structure of quantum electrodynamics. It is of course possible that, for some reason, our measurement is erroneous. But so far no such error has been identified. Hänsch: That’s correct. Meanwhile we believe that our muon measurements may actually be right and that the proton really is smaller than we have long thought. This then raises the question of why the previously determined value is too high. Measuring the size of the proton is a relatively tricky undertaking. The first measurements made use of data for the scattering of high-speed electrons by hydrogen nuclei. Later on, we discovered how to measure the wavelengths of the optical spectral lines of hydrogen with such precision that we could use theoretical arguments to determine the charge radius of the nucleus itself. Two parameters play a critical role in this approach – the Rydberg constant, which is a constant of nature, and the size of the nucleus. Both of these are fundamental parameters in physics. Hänsch: Yes. That’s why we plan to measure the proton radius again, this time using more precise spectroscopic methods on normal hydrogen, in order to see whether we can detect any error in the early measurements. It may turn out that the discrepancy remains, which might mean that we have stumbled on something very important. But you now believe that the difference of 4% is in fact valid? Hänsch: At the moment I would be willing to bet that the proton radius really is 4% smaller than the accepted value, and that the older measurements on which the latter is based are in error. That would be a sensational discovery, would it not? Hänsch: If the difference turned out to be real, that would indeed be sensational. Discoveries like that are extremely rare. But now the ball is in the theorists’ court. Theoreticians are extremely imaginative and resourceful. There are already around 100 papers that consider ways to explain the discrepancy. And some authors speculate about new physics beyond the Standard Model. Is some new physics on the horizon? Hänsch: In physics humility is a virtue. What we understand makes up only a few percent of the matter in the Universe. Nobody knows what dark matter is made of. It wouldn’t be surprising if this problem were to point to hitherto unknown interactions. There are two ways to discover such novel interdependencies. One is to work with huge accelerators, such as the Large Hadron Collider at CERN in Geneva, where one tries to reach ever higher energy levels. Our approach is to measure fundamental parameters with ever higher precision, at low energy scales and using relatively modest instrumentation. That sounds as if you have taken to heart the advice of you mentor, the Nobel Laureate Arthur Schawlow: ‘Never measure anything but frequencies’? Hänsch: Certainly. Measuring frequencies is essentially a matter of counting. First, you need a laser beam with a highly stable oscillation frequency. In principle, all you then have to do is count the number of oscillation cycles per second. Meanwhile, we have learned how to measure fractions of oscillations, and can compare the frequencies of two light beams out to 20 decimal places. How has laser spectroscopy developed since you began your work in the field? Hänsch: In the beginning we could only measure the wavelength of the light from a laser. Subsequently so-called frequency chains were developed in a few large laboratories, with which one could measure the frequency of laser light at a few selected spectral lines. But the systems of instruments involved were so large that, as in the case of the set-up at the Physikalisch-Technischen Bundesanstalt in Braunschweig (Germany’s National Metrology Institute), several buildings were needed to accommodate them. For a long period time, we used a special helium-neon laser as a comparative standard to take advantage of the precision of the large-scale frequency chain in our lab, and we had to transport it regularly back and forth between Braunschweig and Munich by car for calibration. Nowadays, these measurements can be carried out with instruments not much bigger than a shoebox. One directs a light beam of unknown frequency into an optical fiber and can read off the frequency on a monitor to the desired level of accuracy. Here you are referring to the frequency comb generator, for which you received a Nobel Prize. Since then, you have designed novel spectroscopic methods based on the same principle. Can you tell us about your latest creations? Hänsch: We can use the very large number of optical “teeth” in a frequency comb to characterize complex molecular spectra rapidly and accurately. It would, for instance, be very interesting to be able to distinguish between different types of proteins in cells under the microscope without having to stain or otherwise label them -- and do it so quickly that one can image them in real time. At the moment we are trying to figure out how to miniaturize frequency-comb spectrometers so that they can fit on a chip. What is it that drives you on? Do you have a passion for precision? Hänsch: You could say that. I have always been fascinated by the fact that things can be measured with extremely high precision. It has an aesthetic appeal for me -- and it enables us to demonstrate that our theoretical models are not simply figments of imagination. Page 2: Have you always known how important precision is?